Now that we know about unification, we are in a position to learn how Prolog actually searches a knowledge base to see if a query is satisfied. That is, we are ready to learn about proof search. We will introduce the basic ideas involved by working through a simple example. It is probably clear that there is only one answer to this query, namely k(b) , but how exactly does Prolog work this out? Let’s see. Prolog reads the knowledge base, and tries to unify k(Y) with either a fact, or the head of a rule. It searches the knowledge base top to bottom, and carries out the unification, if it can, at the first place possible. Here there is only one possibility: it must unify k(Y) to the head of the rule k(X) :- f(X), g(X), h(X) . k(_G34) :- f(_G34), g(_G34), h(_G34). Everything in a box is either a query or a goal. In particular, our original goal was to prove k(Y) , thus this is shown in the top box. 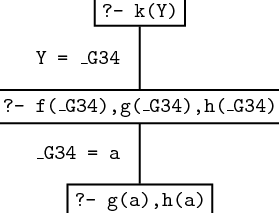 When we unified k(Y) with the head of the rule in the knowledge base, X Y , and the new internal variable _G34 were made to share values, and we were left with the goals f(_G34),g(_G34),h(_G34) , just as shown. But there is no way to satisfy h(a) , the last remaining goal. The only information about h we have in the knowledge base is h(b) , and this won’t unify with h(a) . So what happens next? Well, Prolog decides it has made a mistake, and checks whether it has missed any possible ways of unifying a goal with a fact or the head of a rule in the knowledge base. It does this by going back up the path shown in the graphical representation, looking for alternatives. 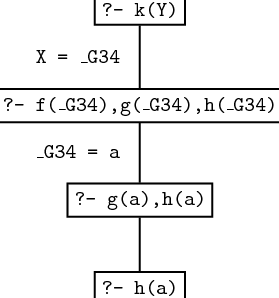 Now, there is nothing else in the knowledge base that unifies with g(a) , but there is another way of unifying f(_G34) . Points in the search where there are several alternative ways of unifying a goal against the knowledge base are called choice points. Prolog keeps track of choice points it has encountered, so that if it makes a wrong choice it can retreat to the previous choice point and try something else instead. This process is called backtracking, and it is fundamental to proof search in Prolog. Moreover, this fact too is in the knowledge base, so this goal is also satisfied. So Prolog now has an empty list of goals. This means that it has now proved everything required to establish the original goal (that is, k(Y) ). So the original query is satisfiable, and moreover, Prolog has also discovered what it has to do to satisfy it (namely instantiate Y to b ). This forces Prolog to backtrack to the last choice point, to try and find another possibility. 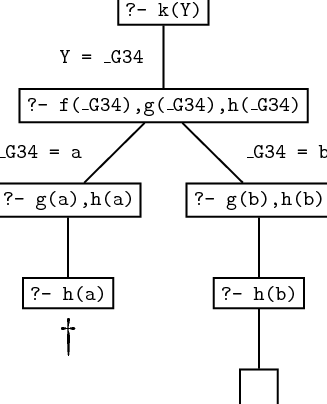 However, there are no other choice points, as there are no other possibilities for unifying h(b) , g(b) , f(_G34) , or k(Y) with clauses in the knowledge base, so Prolog would respond no. On the other hand, if there had been other rules involving k , Prolog would have gone off and tried to use them in exactly the way we have described: that is, by searching top to bottom in the knowledge base, left to right in goal lists, and backtracking to the previous choice point whenever it fails. Let’s take a look at the graphical representation of the entire search process. Some general remarks are called for, for such representations are an important way of thinking about proof search in Prolog. This diagram has the form of a tree; in fact it is our first example of what is known as a search tree. 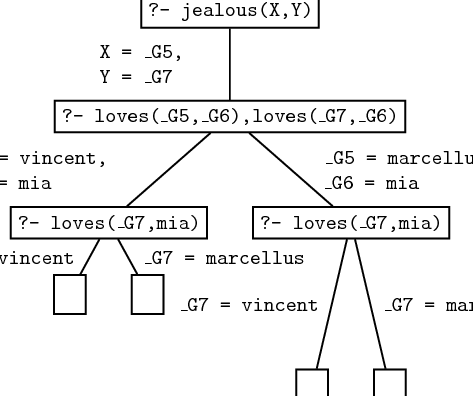 The nodes of such trees say which goals have to be satisfied at the various steps of the proof search, and the edges keep track of the variable instantiations that are made when the current goal (that is, the first one in the list of goals) is unified to a fact or to the head of a rule in the knowledge base. Leaf nodes which still contain unsatisfied goals are points where Prolog failed (either because it made a wrong decision somewhere along the path, or because no solution exists). Leaf nodes with an empty goal list correspond to a possible solution. The edges along the path from the root node to a successful leaf node tell you the variable instantiations that need to be made to satisfy the original query. Work through this example carefully, and make sure you understand it.